Recently, we were honored to learn that we will be the recipients of this year’s City of Hope Spirit of Life Award. City of Hope is a hospital and research center focused on cancer research, education, and treatment. For the two of us, this award is particularly meaningful. Like so many of our friends and colleagues at Gensler, our families have been touched by cancer, and we’ve seen firsthand for the past eight years the amazing work that City of Hope has been doing to fight the disease and bring comfort to those affected by it. 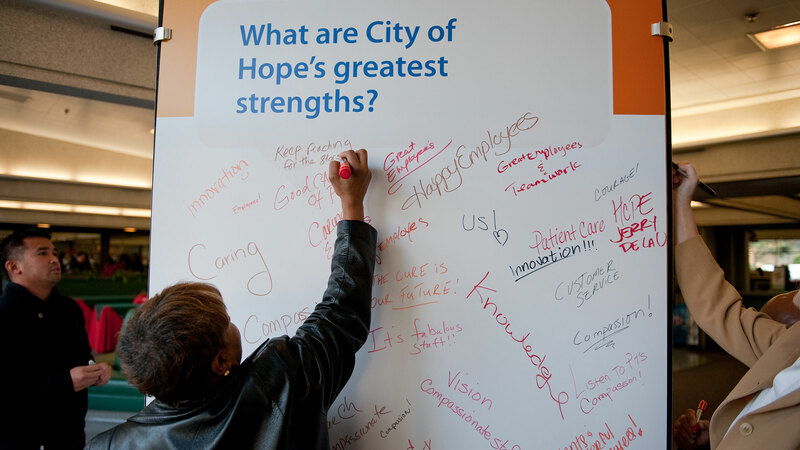 When we first learned about the opportunity to work with City of Hope in 2011, we knew it would be a perfect fit. While Gensler and City of Hope are very different entities, there are many similarities in our missions and dreams about the future. We’re both focused on research-driven solutions, are both innovative, and are both driving the human experience forward for everyone’s benefit. Gensler hosted listening sessions with the City of Hope team before designing a master plan for the research center. Since our two organizations started working together, we’ve collaborated on important projects meant to reassure cancer patients and inspire the City of Hope staff. Before our first project — a series of branded employee engagement and experience initiatives across the organization — the Gensler Los Angeles team held listening sessions with the research center’s leadership. Later, we used these sessions as the foundation to create a holistic master campus plan that unified the organization’s strategic vision and values. In the design process, particular emphasis was placed on shaping a cohesive user experience for a diverse, shift-based organization focused on the patient. Later, City of Hope engaged Gensler to redesign a medical office space with a strong focus on wellness. Wellness in the workplace was the core design focus for the project, and it incorporated an outcome-driven strategy to support City of Hope’s employees and help them transform the future of health. At Gensler, our guiding principles help us elevate the human condition through the power of our people and a diversity of thinking, talents, and experiences. We design at the human scale and pay special attention to the interactions individuals have — and will have — with our work. Similarly, City of Hope focuses on the holistic experience of each individual who enters its doors, whether he or she is a patient, doctor, student, or visitor. Being “people-centered” is part of both of our DNA. The Spirit of Life Award has been presented to a wide range of individuals across industries and professions. But we are all connected by a commitment to elevating the human condition, and we share a profound belief in the power of each individual to affect change. I’m proud to say that each of my colleagues embodies this spirit, and we are proud to accept the award on behalf of the entire firm. To join us during this celebration or to support City of Hope’s life-saving endeavors, visit Spirit of Life Celebration.